Rwanda Education Board (REB) on 4 to November 5, conducted an early learning awareness activity in Rusizi District, to demonstrate the Government of Rwanda’s commitment to ensuring the provision of high-quality early grade learning (Pre-Primary to P3) in Rwanda. The visit centered around outreach to Nkombo Sector, an island in Lake Kivu which has three primary schools and where the visiting delegation met with teachers, community members, and education leaders to discuss the importance of early learning for social and economic transformation. The activity was marked by visits to education development partners’ activities in the region which aim to support the provision of early learning because access to high-quality early learning requires adequate support for infrastructure, pedagogy, and learning materials, among others. These included trainings being conducted in Kamembe for head heachers, and TTC tutors by VVOB and BLF, respectively, as well as demonstrations of effective early grade teaching of Kinyarwanda supported by USAID Soma Umenye, effective early grade teaching of mathematics and English by BLF, and literacy promotion through community reading clubs by Mureke Dusome. Teaching and Learning Materials to support Early Learning were handed over to the Head Teacher of St. Pierre Primary, including P1 Kinyarwanda Textbooks, Pupils Activity Books for P1 and P2 English and Mathematics, and early childhood education toolkits. The activity was closed by the Launch of Andika Rwanda 2019 National Writing Competition and the closing of the National Literacy Month. The delegation included the Minister of State for Primary and Secondary Education, Dr. Isaac Munyakazi, the USAID Mission Director in Rwanda, Leslie Marbury, the Vice-Mayor of Social Affairs in Rusizi District, Emmanuel Nsigaye, the Director General of Rwanda Education Board (REB), Dr. Irénée Ndayambaje, the Flemish Association for Development Cooperation and Technical Assistance (VVOB), the United Nations International Children’s Emergency Fund (UNICEF), and the Building Learning Foundations (BLF), officials from Rusizi District, teachers and local stakeholders. 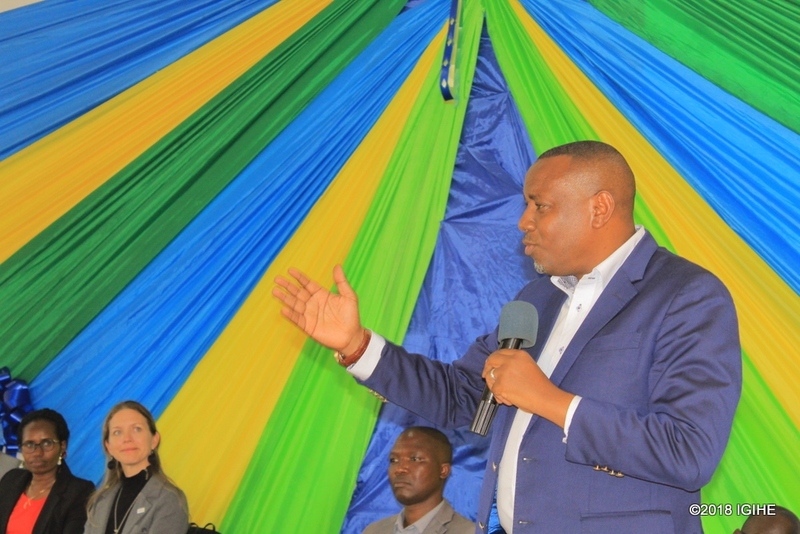 In his general remarks, Dr. Isaac Munyakazi, the Minister of State for Primary and Secondary Education, emphasized the importance of quality education to achieve foundational skills in literacy, numeracy, and English. He also appreciated all partners; whose interventions play an important role in early learning programs in Rwanda. He said that the Ministry of Education was happy to collaborate with the Ministry of Sports and Culture and Rwanda Reads to make National Literacy Month a huge success. He added that they will encourage more people to read. “We expect a big impact to improve the culture of reading in Rwanda. As we continue our collaboration, we will continue to encourage more people to read books, buy books and borrow books,” he said. The purpose of Rwanda’s National Literacy Month 2018 was to spur children and adults throughout Rwanda to read, write, and embrace literacy as the foundation for learning, a tool for life and a means for individuals to contribute to Rwanda’s national ambitions.